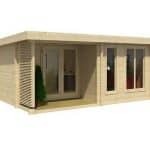 The 5m x 3m Right Sided Corner Lodge Plus Log Cabin is an incredible garden building that could be used for multiple purposes, from a summer house to a home office. The stylish exterior with large windows and two entrances, this is a log cabin with the wow factor. 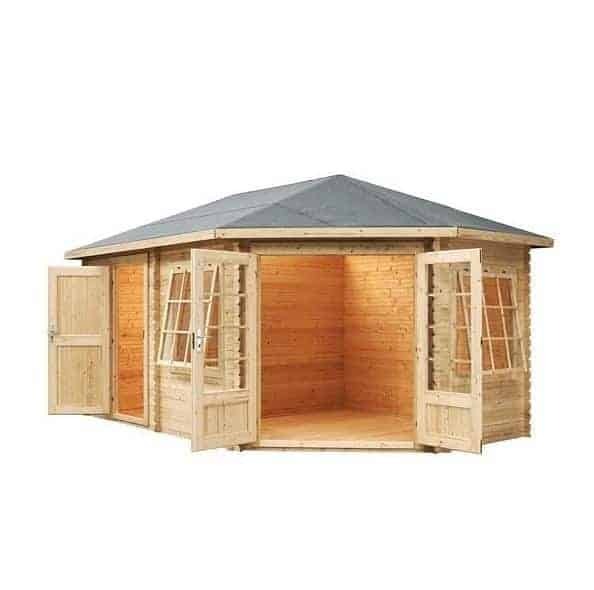 This extra-large and spacious log cabin comes with 28 mm tongue and groove cladding, so you can be assured of a robust structure. Along with that feature comes the fact that the cabin has Baltic pine in it, which is a very robust and slow-grown wood that brings plenty of extra protection against rot and the elements in general. You can enjoy the summer evenings with double door access that allows in plenty of light. Light, single glazed windows add to the overall effect. This cabin has been designed for homeowners to have a right corner garden. There is also a left-sided version available for those seeking the opposite. The large, multi-paned windows are fully functioning, allowing them to be opened and allowing air to circulate. Double doors and an additional single door towards the back of the building provide good access for this large garden building. 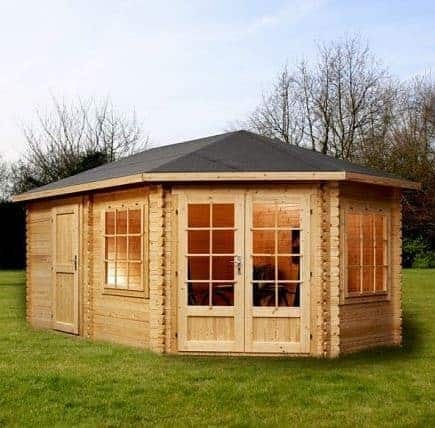 This is a fantastic log cabin that is designed to meet the specific needs of a spare right corner within your garden. In this section we will look in further detail at the many features that the corner lodge has to offer, as well as discussing potential uses of the generous interior space. We understand that a large purchase such as this takes a lot of consideration and has to be fit for purpose and tick all of the boxes for your requirements. Exterior: The log cabin has an attractive exterior and would certainly make a wonderful feature within your garden. Specifically designed for a right-sided corner within a garden, the doors and windows are organised on just two side of the building. The 28mm tongue and groove cladding gives the cabin a traditional appearance whilst being weatherproof and protected from the elements. Interior: The tongue and groove wall cladding and flooring provide a traditional log cabin interior. 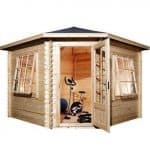 The 16’x10’ interior is extremely generous and could be used for a multitude of purposes, ranging from a general multi-purpose summer house to a personal gym or home office. Windows: The windows are on two sides of the log cabin and, along with the glazed double doors, create a light-filled interior and happy environment. Fully functional and on hinges, the windows open to allow fresh air to circulate throughout the cabin. They also provide wonderful, uninterrupted views out to the garden, whatever the time of year and whatever the weather. Doors: With three-quarter glazed doors to the front of the log cabin and a single timber side door, this log cabin offers two sets of doors for easy accessibility whatever the purpose. You may wish to leave the double doors for decoration and open them out to the garden during warm weather whilst using the side door for everyday access; there are many options to consider. Security: Both single and double doors come complete with a lock and key to keep the doors firmly shut and ensure that the interior contents remain safe whilst not in use. 5m x 3m Right Sided Corner Lodge Plus Log Cabin: How easy to build? The Corner Lodge will require two people to assemble it due to the sheer size and weight of the panels and parts, and of course for safety reasons. Please note that there is a professional home installation service for those with little to no DIY skills, or those who simply do not wish to undertake assembly of such a large garden building. For those who will be assembling the log cabin, full instructions are provided, as well as all of the panels, roofing, glazing, fixtures and fittings required for a straight-forward assembly process. We expect that the log cabin could be built within 1-2 days, depending on the level of DIY knowledge and experience you possess. 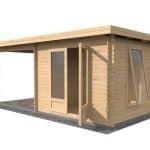 5m x 3m Right Sided Corner Lodge Plus Log Cabin: What is the overall quality like? The log cabin is a very stylish garden building with a traditional log cabin appearance. With 28mm tongue and groove cladding, both the interior and exterior have a charming feel, whilst the interlocking timber boards protect the building from the elements. The building uses FSC certified timber which carries a 10-year anti-rot guarantee from the manufacturer. The guarantee is upheld on the provision that the cabin is well maintained and has a timber preservative treatment applied annually. Various options are provided for both roofing shingles and glazing during the purchase process, allowing you to customise the log cabin to suit your requirements and budget. 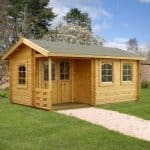 The 5m x 3m Right Sided Corner Lodge Plus Log Cabin gives a great first impression and would certainly add a wow factor to your garden. 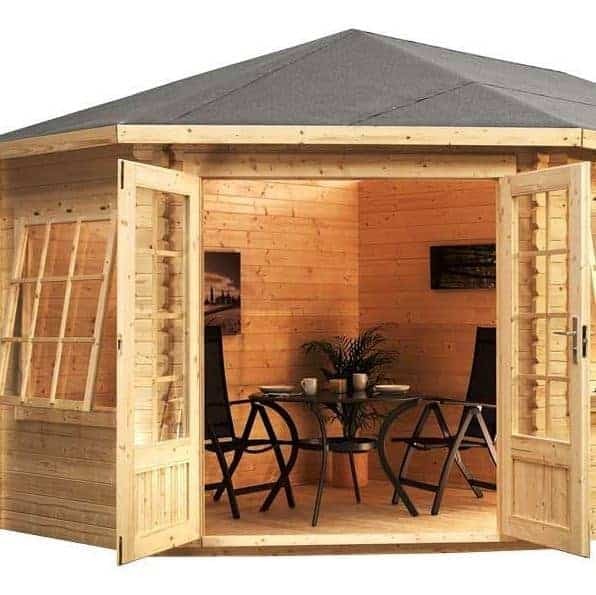 This attractive, traditionally-styled log cabin could serve a multitude of purposes for the whole family; from a hobby room to a home office, the fantastic 16’x10’ interior space is a generous size. 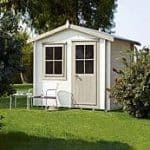 At this high-end price, the log cabin is certainly a deluxe model, but if you are looking within this price range, the space combined with the many features this cabin has to offer definitely makes it a contender.